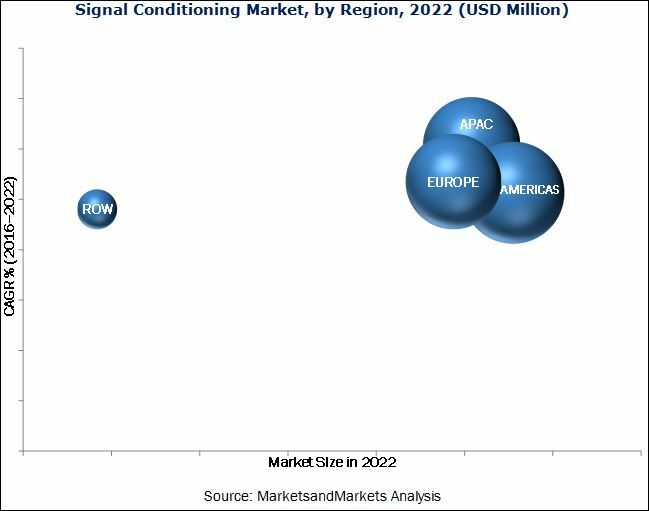 The signal conditioning modules (SCM) market was valued at USD 561.2 Million in 2015 and is expected to reach USD 817.5 Million by 2022, at a CAGR of 5.46% during the forecast period. The base year considered for the study is 2015 and the forecast period is between 2016 and 2022. To define, describe, and forecast the global SCM market on the basis of form factor, application, end-user industry, input type, and geography. The research methodology used to estimate and forecast the SCM market begins with obtaining data on key vendor revenues through secondary research from sources such as Manufacturing Automation, Automation World, UN-Water: Statistics, and RTC Magazine, among others. The vendor offerings have been taken into consideration to determine the market segmentation. The top-down procedure has been employed to arrive at the overall market size of the global SCM market from the total shipment of SCM worldwide and their average selling price in USD. After arriving at the overall market size, the total market has been split into several segments and subsegments, which have then been verified through primary research by conducting extensive interviews with key people such as CEOs, VPs, directors, and executives. These data triangulation and market breakdown procedures have been employed to complete the overall market engineering process and arrive at the exact statistics for all segments and subsegments. This report provides valuable insights regarding the value chain of the SCM market, which comprises research and development; hardware and component providers; manufacturers; marketing and sales; end users. The SCM system ecosystem comprises manufacturers such as AMETEK, Inc. (U.S.), Linear Technology Corp. (U.S.), Analog Devices Inc. (U.S.), Keysight Technologies (U.S.), National Instruments, Corp. (U.S.), TE Connectivity Ltd. (Switzerland), Rockwell Automation, Inc. (U.S.), Weidmüller Interface GmbH & Co. KG (Germany), and Yokogawa Electric Corp. (Japan), among others. The global SCM market, in this research report, has been segmented on the basis of form factor, application, end-user industry, input type, and geography. The signal conditioning modules (SCM) market was valued at USD 561.2 Million in 2015 and is expected to reach USD 817.5 Million by 2022, at a CAGR of 5.46% during the forecast period. Factors such as transition from traditional data acquisition system to PC based systems, strong distribution channels of the manufacturers, and increasing demand for signal conditioners from the water & wastewater, energy & power, and food & beverages industries are expected to boost the growth of the market for signal conditioning market during the forecast period. The SCM market, on the basis of form factor, has been segmented into DIN rail-/rack-mounted modules and standalone/modular modules. Among these two segments, the market for standalone/modular modules is expected to grow at the highest rate during the forecast period. Modular or standalone signal conditioners provide easy and convenient solutions to signal conditioning market problems in measurement and control applications. These modules have applications in data acquisition systems, control systems, and computer-based measurement systems. The SCM market, on the basis of application, has been segmented into data acquisition, process control, and others, including surge protection, signal splitting, and remote diagnosis. Among these segments, the market for process control applications is expected to grow at the highest rate during the forecast period. Signal conditioners in process control applications separate the supply voltage from the input and output circuits and enable the analog circuit to operate with one operating voltage. Moreover, signal conditioners electrically separate input as well as output signals from each other. This eliminates the differences caused by common reference points and provides protection against irrevocable damage caused by overvoltages. The SCM market, on the basis of end-user industry, has been segmented into water & wastewater, chemical processing, oil & gas, energy & power, metals & mining, paper & pulp, food & beverages, aerospace & defense, and others (pharmaceuticals and cement). The markets for the water & wastewater and energy & power industries are expected to grow at a higher rate, followed by the market for the food & beverages industry. The SCM market, on the basis of input type, has been segmented into temperature input, process input, frequency input, and LVDT/RVDT. Process input accounted for the largest market share in 2015 and is expected to dominate the global SCM market during the forecast period due to the wide adoption of signal conditioning market in the manufacturing and process industries. The SCM market, based on geography, has been segmented into the Americas, Europe, APAC, and RoW. The SCM market in APAC is expected to grow at the highest rate during the forecast period. The market growth can be attributed to the high investments in infrastructure, growing need for industrial automation processes, and increasing need to comply with government policies and regulations in APAC. Complexities in the selection of appropriate signal conditioners and competitive pricing among global and regional players are some of the major challenges faced by the players in the global SCM market. Key players in this market focus on strategic partnerships, acquisitions, agreements, and new product launches to increase their revenue and grow in the market. For instance, AMETEK, Inc. focuses on expanding its presence in high-growth market segments and other geographic regions. It develops innovative products to expand in the existing markets and establish its presence in the new and potential markets. For instance, in September 2016, the company introduced the new SentinelEX PXI Express (PXIe) Switching Series, a latest addition to its SentinelEX PXIe Test and Measurement Suite. 13.10 Weidmüller Interface GmbH & Co. Kg. 13.14 ICP Das Co., Ltd.